I sewed like crazy on Sunday to make up for no sewing on world wide quilting day I completed my half triangles quilt top and I love it. I started this quilt because as a new(ish) quilter, choosing the farmers wife quilt as my first big project, is not the most satisfying time wise. 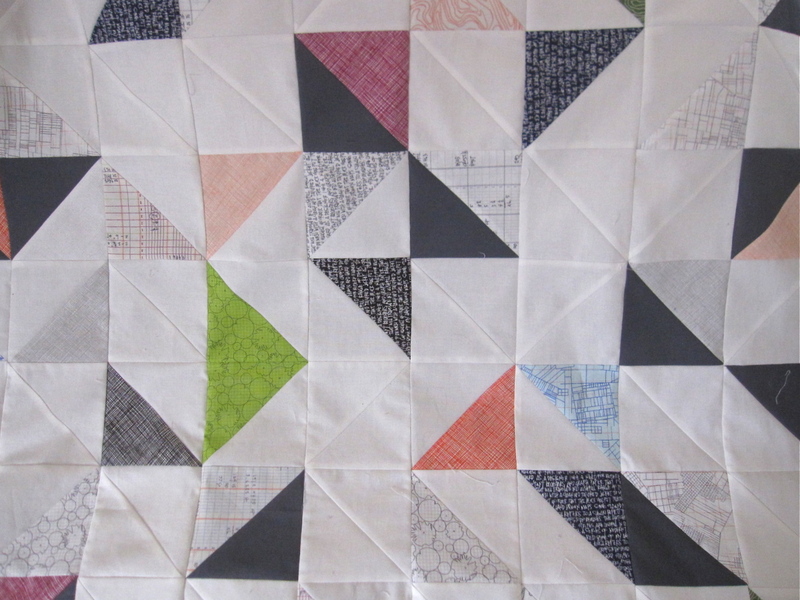 Don’t get me wrong, I love the fw quilt, but it is slow going and completion is not very close in sight. 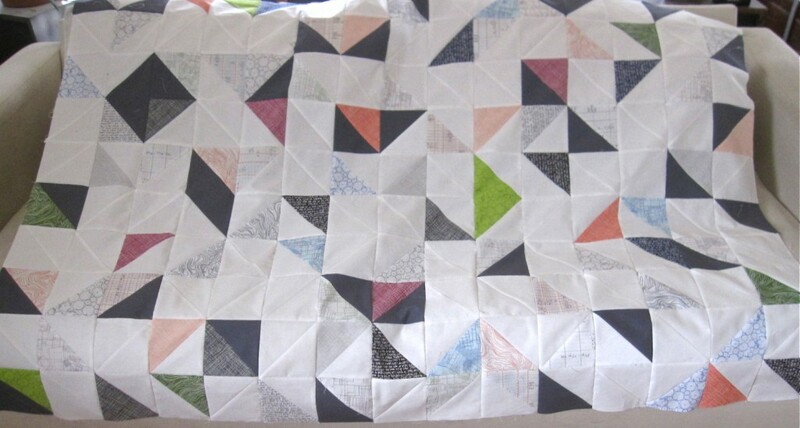 I was determined not to start too many quilts at once, I don’t want to end up with a massive pile of wip’s, but I’ve been having so much fun doing Craftsy’s block of the month class I realised I needed another project. Not fiddley little farmers wife blocks and not only once a month. I bought a charm pack (5inch squares) of Carolyn Friedlanders Architextures a while ago because I LOVE it all and wanted to choose my favorites and order more. 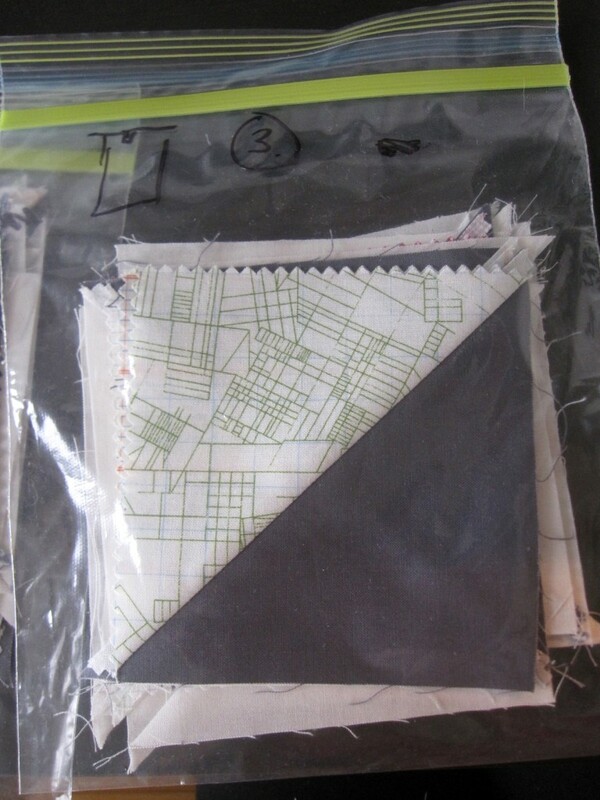 While I don’t tend to like using just one line of fabric in a quilt – I love Architextures so much I decided to make a minimal half triangle quilt using the charm squares and some kona solids (snow and coal). I mentioned before how I really have a deep need for all the corners/points to line up, so actually it took me a little while to get this quilt top right. 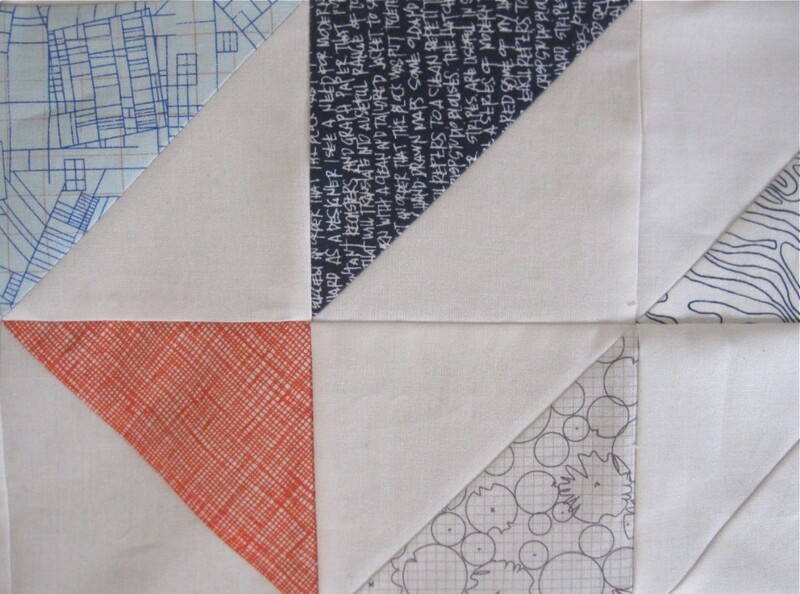 (I’m sure there are quilters tricks for that, I’m yet to discover!) It came together faster than any quilt I’ve made so far, so I’m now going to figure out where to purchase some batting near me. I want to back the quilt in Ikea’s number text, but we’ll see about hitching a ride out there. I am notoriously bad at Ikea. And by bad I mean indecisive. (Most people love/hate that place I reckon). 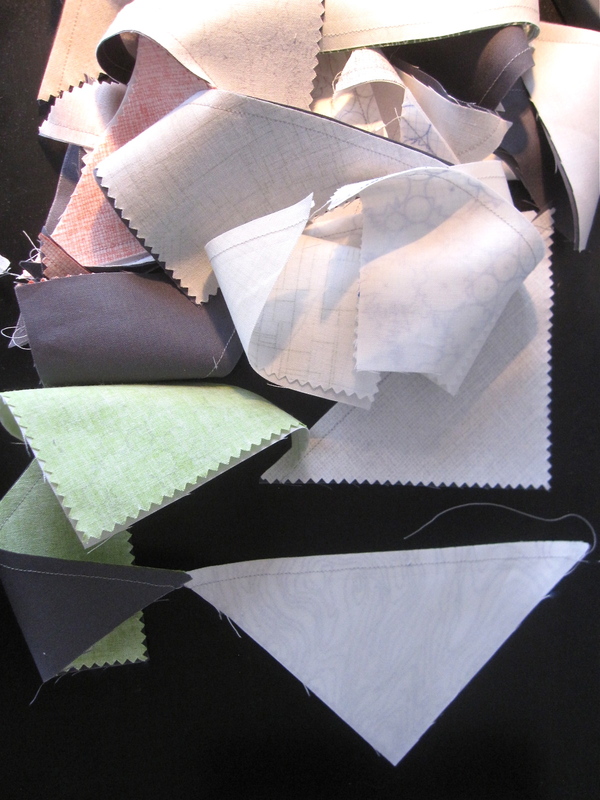 I thought I invented chain piecing (HA) because I wanted to use less thread and go faster, then I realised of course it’s a real thing. And I don’t have the luxury of being able to lay out my quilt much. So I lay it on the floor once, take a picture and then use ziplock bags to keep my rows in order. Then I number the bags. 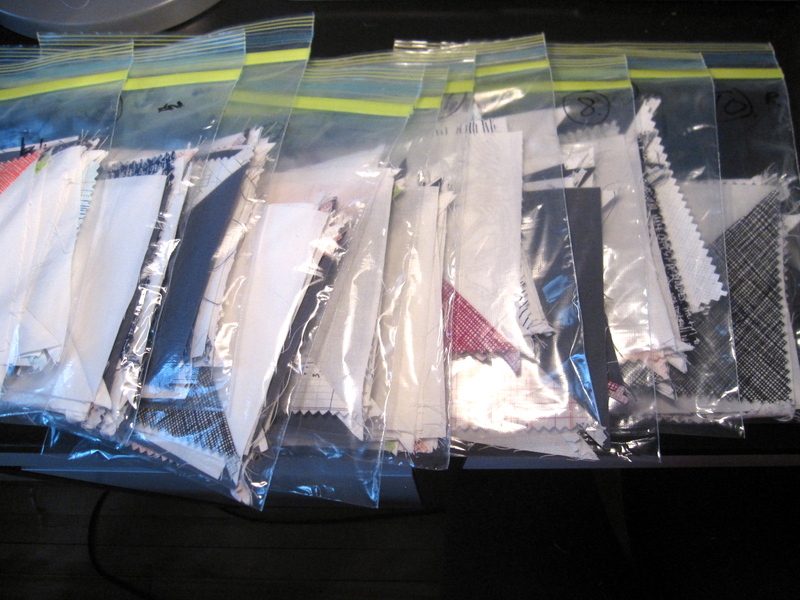 So I sew the top square in each bag to make a row. So easy! I use the photo in case of any discrepancies but it works a treat. 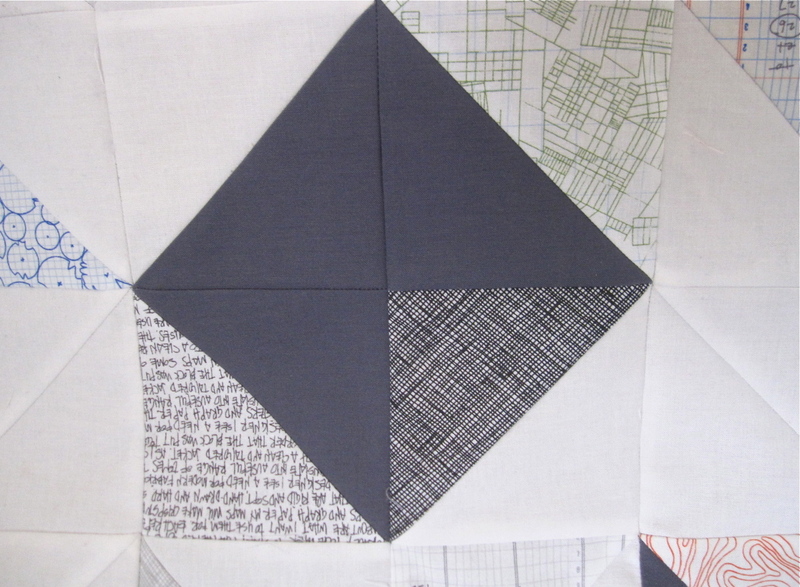 So while I research quilt filling and hunt Montreal for an actual craft store, I’ll get back to sewing more farmers wife blocks. I only have a few dozen to go, so I really shouldn’t lag now. Almost 80 done which is impressive if you know me! WOW – great work – you got so much done and it looks amazing! One day I will tackle more than squares again!! This is soo cool Wendy. I love the fabrics and the modern feel of this. Love, love, love.